I had been called away from town for a few days, and on my return found Poirot in the act of strapping up his small valise. 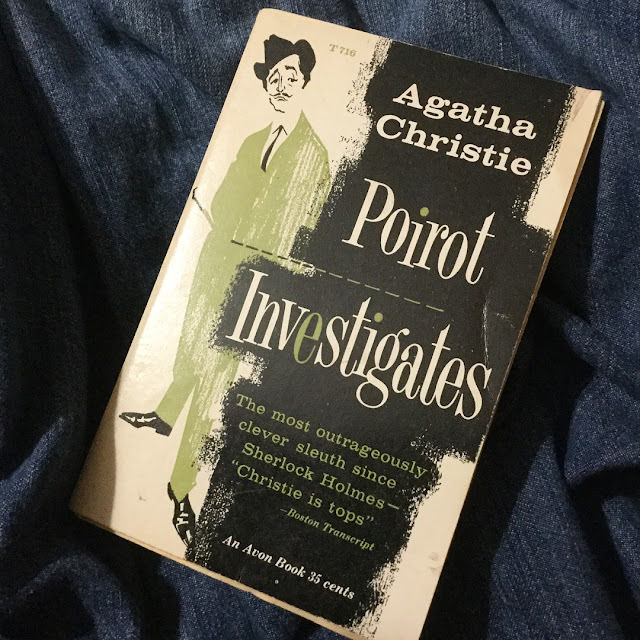 About Poirot Investigates by Agatha Christie*: The very first collection of superb short stories featuring Hercule Poirot and Captain Hastings...First there was the mystery of the film star and the diamond! then came the 'suicide' that was murder! the mystery of the absurdly chaep flat! a suspicious death in a locked gun-room! a million dollar bond robbery! the curse of a pharoah's tomb! a jewel robbery by the sea! the abduction of a Prime Minister! the disappearance of a banker! a phone call from a dying man! and, finally, the mystery of the missing willl. What links these fascinating cases? 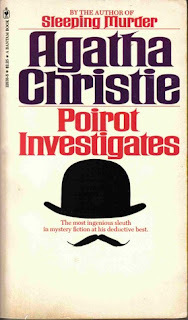 Only the brilliant deductive powers of Hercule Poirot! I've been a huge Agatha Christie fan since high school and anything she writes, I will read. When I went to the thrift store, a whole bunch of vintage Christies were there and I had a hard time not snapping them all all (there were over a dozen!). I decided to take home this copy though, and feel a little antsy abut actually reading it because the pages are starting to fall out. Meanwhile, I know the blog is silent. I'm still reading Neil Gaiman's The View from the Cheap Seats. * I'm taking a break of sorts. When I'm back, I'm back. Is there a specific author you can't resist when in a bookstore?